Veotec is an humanist sans typeface created by Rebecca Hurst and published by The Northern Block Ltd that contains 6 weights (from Thin to ExtraBold) and a full European character set. Angles have gone through a methodical process and it can be use for a range of devices on screen & print. 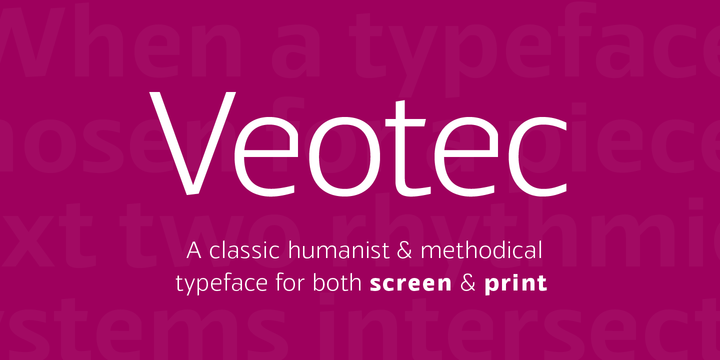 Note: Veotec is a trademark font name of The Northern Block Ltd.
A font description published on Monday, March 2nd, 2015 in Fonts, Rebecca Hurst, The Northern Block by Alexandra that has 3,027 views.